EDMONTON, AB, (May 8, 2018) – All Weather Windows is thrilled to announce that we are the 2018 recipient of the ENERGY STAR Canada Sustained Excellence award for products. 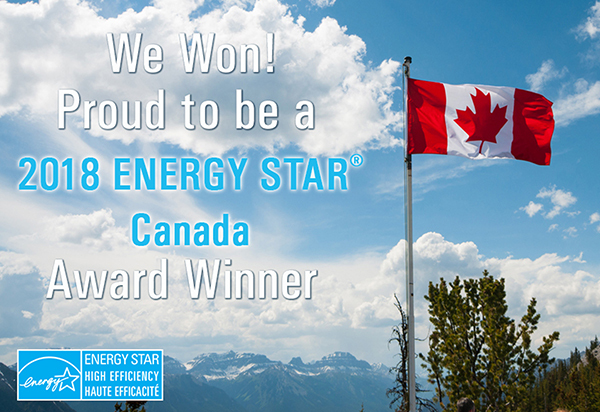 ENERGY STAR Canada recognizes one organization that has maintained or surpassed its ENERGY STAR commitment and accomplishments of the previous years. Nominations for this award are put forth by ENERGY STAR Canada to companies that have been active promoters of ENERGY STAR for at least five years. Celebrating 40 years in business this year, this award represents All Weather Windows’ commitment to the ENERGY STAR Canada program and the continuous improvement of our products. Energy efficiency is central to our strategy and our brand; in fact, 196,000 All Weather Window product models are ENERGY STAR certified. In 2017, we had an increase of 39% over the previous year in most efficient window models. The ENERGY STAR Canada awards recognize ENERGY STAR Participants in Canada that have demonstrated excellence in promoting the most energy-efficient products and new homes available on the market in Canada. All Weather Windows is an active promoter of ENERGY STAR Canada and has been the recipient of 6 ENERGY STAR awards; including multiple year winner of Manufacturer of the Year for Windows and Doors.